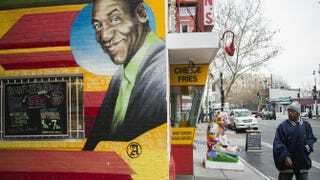 A man walks past a mural of comedian Bill Cosby painted on the side of Ben’s Chili Bowl in Washington, D.C., on Dec. 4, 2014. As allegations of sexual misconduct continue to mount against Bill Cosby, one historical institution has no intention of severing ties with the embattled comedian's artwork. According to the Associated Press, the Smithsonian has no plans to pull the actor's private art collection, which is currently on display and has been since November. "First and fundamentally, this is an art exhibit," Richard Kurin, the Smithsonian's undersecretary for art, history and culture, told AP. "So it's not about the life and career of Bill Cosby. It's about the artists." AP notes that "a third of the Smithsonian's National Museum of African Art's 50th anniversary exhibition came from Bill and Camille Cosby's extensive African-American art collection" and that most of the works have never been exhibited publicly. The works include "paintings by onetime slaves, pieces commissioned for the Cosbys, a piece by Cosby's daughter and quilts made in tribute to Cosby and his slain son, Ennis. The exhibit also includes images of Cosby and quotations from him." The newswire notes that even before the allegations of misconduct began to surface against Cosby, many were against the museum's showing of the private collection, for several reasons. One was that a museum showing can enhance the price of private works. The news site notes that Cosby's wife, Camille, sits on the board and reportedly "initiated the loan, which raises questions about conflicts of interest." Initial reports received by AP did note how the $716,000 exhibit was funded. The Smithsonian later disclosed to AP that the Cosbys funded the entire cost as a gift. AP notes that "guidelines call for museums to make public the source of funding when an art lender funds an exhibit," but none of the information was on any of the documents it received. The Smithsonian said that the information was available upon request, according to the news site. "It just raises a little eyebrow that a trustee of a museum is lending [her] own collection, funding part of the exhibition and the exhibition is highlighting works … by less-well-known artists whose work is considered by some to be undervalued," Noah Kupferman, an art-market expert at Shapiro Auctions, told AP. "Repositioning these artists' works as suddenly important could have significant positive effect on their economic value," he said. According to AP, Smithsonian lawyers reviewed the contract of the loan of artwork and added that whatever perceived value the works gain from being exhibited are of little issue, since the Cosbys have no intention of selling the works. Regardless of the controversy—be it the methods through which the works were received or the accusations being hurled against Bill Cosby—Kurin believes that the exhibition is about the art and nothing more. "We certainly don't condone his behavior," Kurin said. "We're just as deeply disturbed and disappointed as I think everybody else. But it's not about Mr. Cosby. This is an art exhibit."